Now that we had the train system all figured out we struck out on our own, once more heading back into the downtown core of Sydney. We got off at St James station and walked through The Domain to the Botanical Gardens, a collection of plant and animal life that — ducks and grass aside — we just wouldn’t find back home. Like dozens of giant fruit bats, ibises, more kookaburras and gum trees so big they’d fill an entire house. 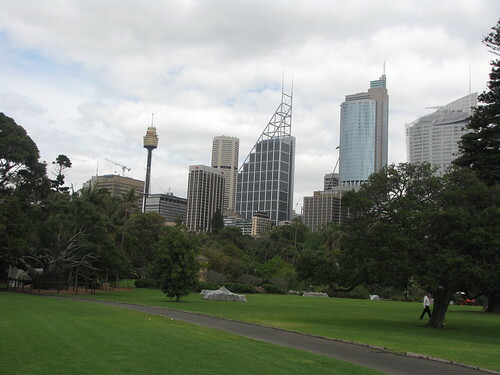 The gardens also afforded us the best view we’d seen yet of the city…the high buildings of the CBD, the Opera House and the Harbour bridge rising over the trees. We walked out the end of the gardens and onto the steps of the Opera House itself. Up close it doesn’t look as shiny white as it does from a distance, and we got a sense of how old it actually is. Sail roof design notwithstanding, it reminded me of my university library. From there we walked back up into the Rocks and, after a little hunting, arrived at the Australian Hotel. This was yet another pub recommendation, and it turned out to be a good one. We drank our cold beer at a table outside, enjoying the sunshine (finally…up to this point it had been somewhat cool and mostly overcast) and feeling very much like we were on vacation. Nellie remarked that, so far, Sydney felt like a combination of London and Halifax. That seemed about right to me. The food at the Aussie didn’t catch our eye, so we walked a couple of blocks to the Belgian Heritage Cafe, a somewhat more upscale establishment. This felt a bit like cheating, since the beer list was entirely Belgian, but we decided to eat there anyway. 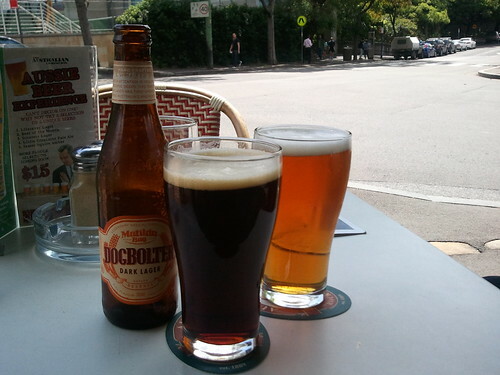 Nellie’s mussels were good, my steak was excellent, our beer was heavy and sweet (like good Belgian beer should be!) and there was more of it than I’d planned on. When the server brought our second round (Achels) he knocked my bottle over. Only for a second, and it spilled only on the tray and not us, but he was very apologetic. To make up for it, he brought me another bottle, free of charge, to go with the 80% or so of the first one still in the bottle. Not a bad deal, but I was more than a little full when we left. Just as we departed the bartender noticed Nellie’s Pony Bar t-shirt and wanted to talk craft beer. We should have sat at the bar, I guess. We picked up some wine on the way home, made dinner for the brother and crashed early. Again.